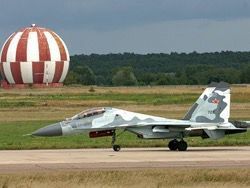 Algeria ordered 14 more fighters of the Su-30MKI type in Russia (And). It was declared by the head of Rostekh state corporation Sergey Chemezov, the correspondent to "Lenty.Ra" transfers. According to Chemezov, the contract was signed even in the spring of the 2015th. Deliveries will carry out in 2016-2017. At present Algeria already uses 44 fighters of the Su-30MKI type (And), let out by Irkut corporation: 28 received on contract 2006th and 16 cars – on an option transferred to the firm order in 2010. The multipurpose supermaneuverable fighter Su-30MKI made on Irkutsk aircraft factory of Irkut corporation, initially was developed for India (since 1999 over 200 cars are transferred to the customer, it is ordered 272). Also, except Algeria, the fighter was delivered to Malaysia (18 units are transferred in Su-30MKM versions). In the Su-30CM version the fighter was ordered by Military and air forces (Air Force) of Russia and sea aircraft of Navy of Russia (80 cars are bought, by 2020 their number is planned to finish to 180) and the Air Force of Kazakhstan (4 units).